It is becoming difficult to find quality Discus. 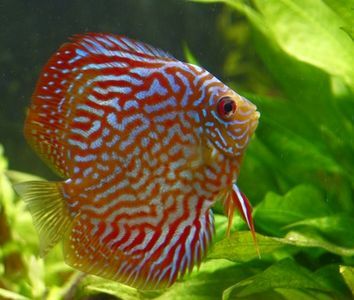 The market is flooded with many poor quality Discus that attract buyers because of their lower cost but the Discus will discourage their owners from the first month and result enthusiasts Discus lost. 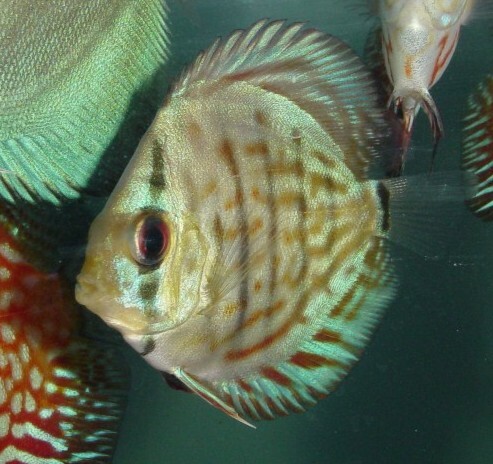 So not only quality but also Discus in general become rare because of their reputation for difficult fish to keep more and more caused by the poor quality. 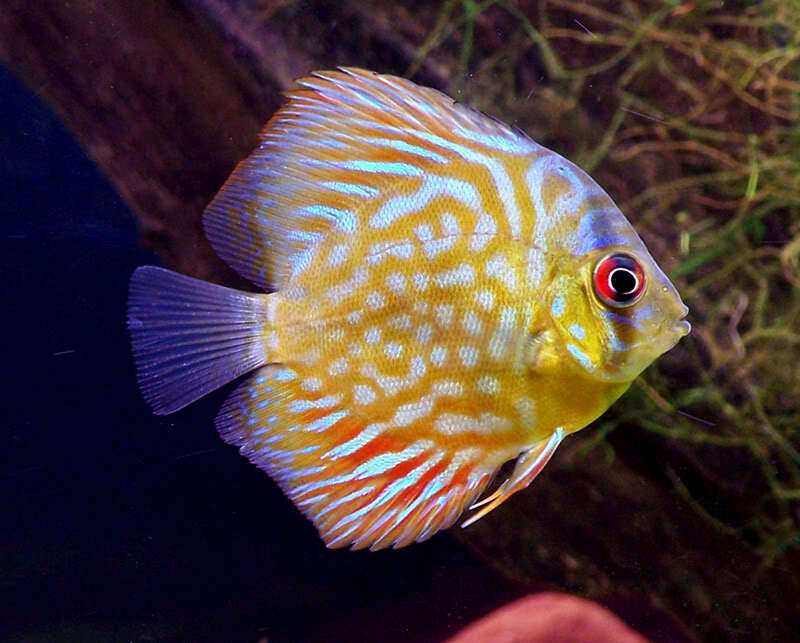 Discus is like everything, the more you put in quality and they will be more beautiful and healthy, but more importantly you will have less problems to keep them. But it is still necessary to recognize quality, that is where we will help you. First rule, do not let you ever influenced by the color of the Discus. 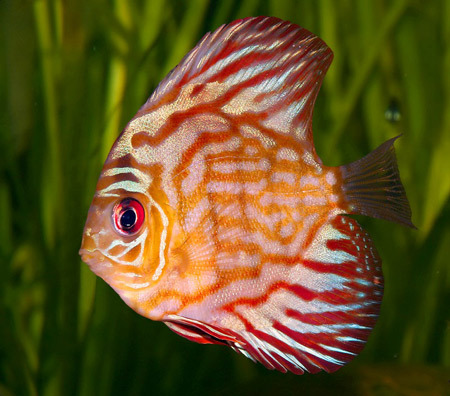 Discus normally begins to color only from 2.5 “-3″. 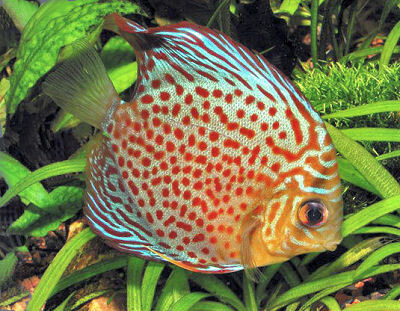 Discus with all its colorful body or part of bright color is a sign of unnatural treatment such as dyes and hormones. They usually have a growth problem because once they leave the farm, they can no longer grow without supplements they had. In addition, such farms Discus often use antibiotics in the feed to minimize disease and therefore their loss. This of course will affect the health and the fragility of your Discus in the long term. They will also often infertile, unable to reproduce. So even if you seem beautiful and healthy, too colorful a Dicus too early will have a good chance not to develop normally. Even an adult can not keep its colors. Beware also of colors that do not seem natural. For example, a yellow Discus will become orange unless you gave him a special food which does not exist in commerce. 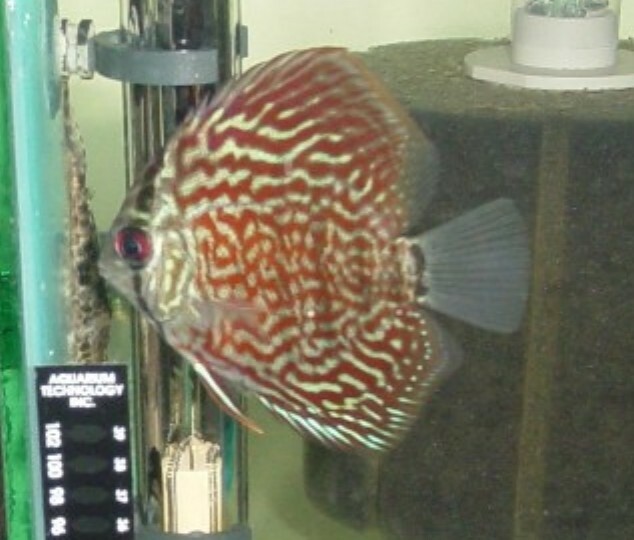 Discus must be round and that after about 1 months of birth, about 1 “. Do not believe if someone told you that he will become rounded as he is not round at 2″ and more. 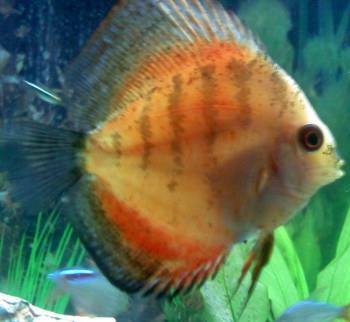 Discus with elongated shape, longer than high, is a sign of poor quality Discus either genetics or by poor nutrition. The eye must be small in proportion to his body with a round shape without defect. A big eye is a sign of retarded growth caused by poor nutrition or worse, internal parasites in the intestines. This is rarely recoverable and those Discus never grow up normally and you take big risk because even if it does not appear sick such Discus is less resistant to various diseases. We see more and more of Discus with eyes distorted as in the example pictures below. 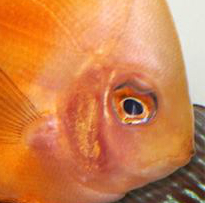 These eyes are not necessarily due to a disease but more of a problem in breeding. 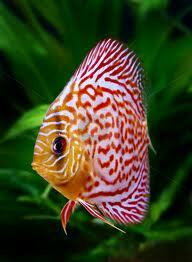 This type of Discus were unnaturally raised. Indeed in all cases, these Discus develop this malformation in the customer or shortly after leaving their breeding. 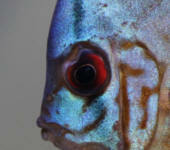 So even Discus do not present this malformation and from the same breeder will be low quality Discus. His body does not reveal bone as the bone of the head or ribs. It is a sign of thinness. Discus is fearful from origin, but for more than 60 years of breeding, they lost this fear to become accustomed to our aquariums, provided that farming is done appropriately. 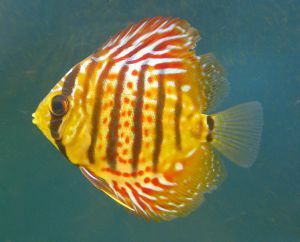 Indeed, many breeding Discus are practiced in plastic bins and these Discus see no human through a window as they will at home in your aquarium. This is the main cause that will make the Discus you will see are often fearful and hidden because they see a human for the first time in front of them. 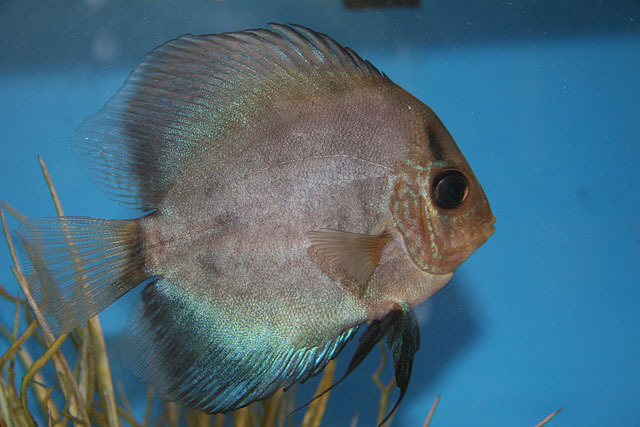 This type of fearful Discus is stressed and therefore fragile, susceptible to various diseases. There are of course many other causes such as finishing of the aquarium or the number of discus but watch our videos where our Discus are in tanks without decoration and when tapped on windows: click here. These videos speak for themselves to prove that our Discus are accustomed to aquariums, a curious character. When you purchase, make sure there is no sign of disease. There are too many disease that we could describe them but as a rule, ensure that those eyes are clear and translucent, her skin is beautiful, smooth and that the fins are deployed. If you see these feces, make sure they are not white. 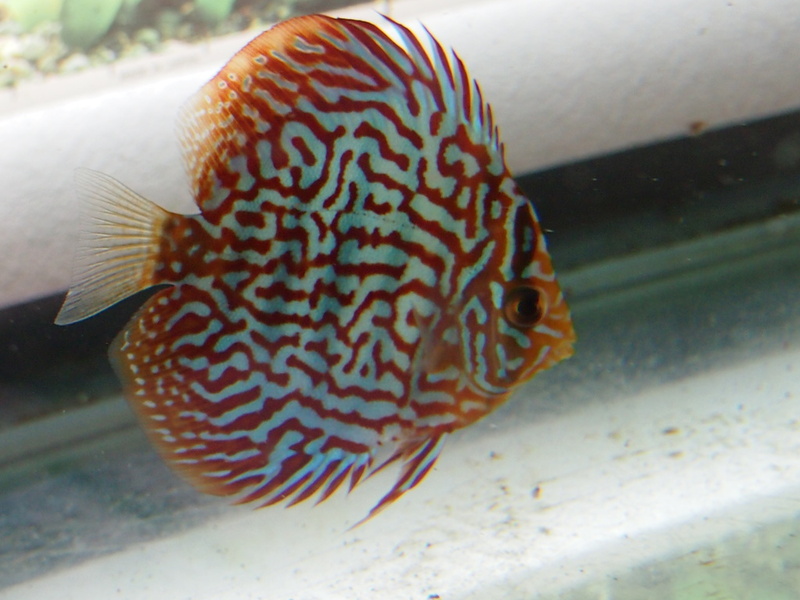 The case of the fins is very delicate because they are fragile and damaged fins reflected not necessarily a bad quality Discus. They may simply have been damaged by another discus or a change in water parameters. But it can also be a health problem or defect that demonstrate a poor quality of Discus. We must therefore recognize and differentiate a malformed fin, sick or simply damaged. The best is of course to take a Discus with entire fins of a beautiful shape that will participate in a round shape Discus. Quality is often equal to higher prices but also success. If a Discus does not seem you expensive, ask yourself of its quality. With quality Discus, you put all the chances on your side but do not forget that it will remain a beautiful Discus if maintenance is also quality. 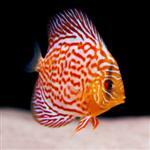 To view high-quality Discus, go to our photo page: click here. Under each name, be sure to click “Change color” to see the Discus depending on their size. I intended to make drawings to show you the various bad qualities but I did not properly arrived and so I took various photos of the web randomly. French translation of the book Shaiffula Yeng, Penang Discus: how to choose his discus.